We now know what Ford is planning for the upcoming Frankfurt Motor Show. The manufacturer has released a slew of photos and information on its new Evos Concept – a design study that will likely influence the look of the company's products in the near future. While we aren't likely to see many four-door gullwing hatchbacks in the Ford product line any time soon, chances are that the automaker's artists will roll in elements like smaller, more discreet headlamps, more vertical hexoganal grille and a sleek silhouette. 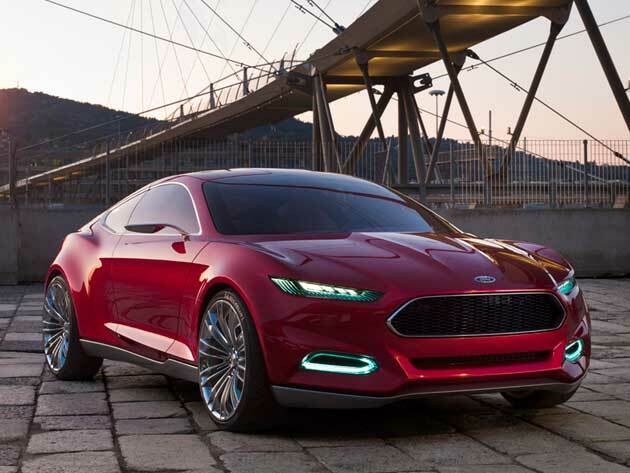 According to Ford design guru J Mays, the new look is penned, "not to provoke, but to seduce." The look is likely to command Ford design for the next five years or so, and you won't hear any complaints from us on that front. Inside, the Evos also hints toward what's coming down the pike in terms of interior design as well. With a driver-oriented instrument panel and an inverted 'L' climate system, Mays says that future Ford models will boast a more cockpit-like feel. Befitting a true concept car, Ford says that the Evos is powered by the same plug-in hybrid drivetrain found in the C-Max Energi. That means that a set of lithium-ion batteries store and release electricity to allow the vehicle to operate primarily as an electric vehicle. Hit the jump for the press release. Looks good, I like it but I really think Ford needs a new grille cause that just screams Dodge to me (just without the chrome bars in it). Ford has really turned their image around. I hope not. That car looks like just another Japanese import. That's my point. Retro is a style trend that needs to be killed with a shotgun. I highly disagree. Retro is a fad, and it's already overstayed it's welcome. Ford has the right idea making fresh designs, and not latching onto the past. You never saw in the 60's, designers constantly bringing back model designs from say, the 30's or 40's...why should GM do the same now? Thing is you only see these 60's flashbacks on musclecars which guess when their start and IMO best era, the 60's. DAMN! That looks pretty sweet! I'd totally get one. It almost has a Bentley Continental GT body to it, with a Aston Martin Grille. DAMN! That looks pretty sweet!